A new study from the University of Sydney found that the amount of time spent sitting may lead to an early grave. 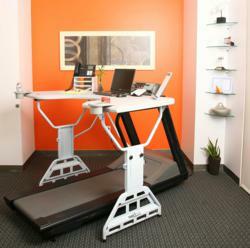 TrekDesk Treadmill Desks offer a solution. The evidence is clear but the message that sitting kills is falling short of reaching the masses. About TrekDesk Treadmill Desks: Designed to fit any existing treadmill, TrekDesk treadmill desk is an affordable, full sized, height adjustable workstation that allows individuals the opportunity to gain the necessary amount of exercise daily to maintain health, prevent disease, strengthen muscles, boost mood and productivity, without requiring additional time during the day or extra motivation. Workout at work with TrekDesk. No sweat!